If you have ever been to a James Ellroy event then you will know that he often introduces himself as the “Demon Dog”. It is a fitting description that encapsulates his life and his writing. Steven Powell is without doubt the acknowledged authority on all things James Ellroy. He has already edited and written two previous works on the author. The first being James Ellroy: Demon Dog of Crime Fiction and also Conversations with James Ellroy. 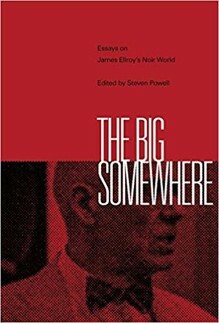 However, with The Big Somewhere we now have a trio of books about Ellroy that should be read by anyone that has an interest in the author, his writing and his influences on the crime-fiction genre. Steven Powell has provided a welcome addition to the scholarly world of the novelist with the introduction alone making for fascinating reading. The Big Somewhere is bound to be seen by many, and especially those with an interest in American culture and literature, as a book that simply has to be read. James Ellroy may be a controversial figure but with these essays one gains a greater insight into how influential he has been, and continues to be so.